Story and photos by 538th L.C. 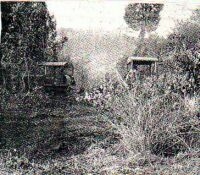 Co.
CLEARING THE WAY--Rome plows of the 538th Land Clearing Team disappear as they move into the undergrowth. 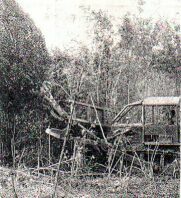 ALONG HIGHWAY 14, the bulldozers of the 538th Land Clearing Company are clearing a right-of-way along the heavily traveled route connecting Pleiku and Ban Me Thuot. 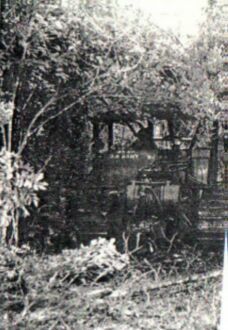 The team is removing overgrowth which could offer cover for enemy ambushes against traveling this route, along the entire 60 mile stretch of road. In a matter of minutes the company can clear an area 150 meters long and 100 meters wide with their D7E bulldozers equipped with Rome Plows. "We clear from 150 to 500 meters of vegetation from the roadside according to the demand of the situation," commented Staff Sergeant Cardoses S. Funches. "In an area that is heavily overgrown and favored as an ambush point, we usually clear 500 meters from the roadside. PLOW POWER--Rome plows can literally chop down large trees such as the one shown here along QL-14. LOADING ROCK--Trucks, on their way to QL-14, are loaded with rock to form a base for the road that the 102nd Engineer company is currently working on. As each section is cleared, the vegetation is piled in large windows, left to dry and later be burned. Performing this job, vital to road security, exposes one to many hazards ranging from poisonous snakes falling from trees to running over land mines. 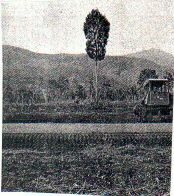 In addition, the men seldom establish a base camp for more than three days because the nature of their work demands that they move where the work is. In spite of these disadvantages, the men prefer their work to other engineering jobs. "Even though there aren't the conveniences of the base camp," commented Specialist Four Brad Paulson, "it's an exciting job and time passes quickly while you're working." 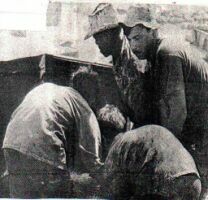 ASPHALT MIXING--Engineers from the 102nd Engineer Company work with Vietnamese to lift a 469 pound drum of JP-3 to be heated and mixed into asphalt for the project. TEAM WORK--The 538th LCT works together to clear the roadway, leaving the brush piled in windrows along the roadside to be burned later. AS PART OF THE SUPPORT OPERATIONS for intense upgrading along Highway 14, a new asphalt plant operated by the asphalt platoon of the 102nd Engineer Company (Construction Support) recently went into full operation. Utilizing crushed rock from the quarry operated by the 584th Engineer Company (Light Equipment), the plant is capable of producing up to 1000 tons of asphalt a day. It is expected to supply finishing material for all road upgrading projects in the area. 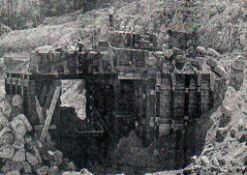 To supplement the manpower of the 102nd, Montagnard personnel also work on the plant insuring that a continuous flow of raw material is fed into it. The engineers found that their new help were rapid learners, and according to First Lieutenant Charles M. Hammond, officer in charge of the plant, "They're doing a number one job." FINISHING TOUCHES--As the bulldozer puts finishing touches on the cleared land, you can see the same tree as shown in photo left, in a much different surrounding. CRUSHING APPARATUS--After the rock is crushed it can be moved by conveyor belts to loading points where it is put in dump trucks for movement. Copyright � ; 2000, 2001, 2002 All Rights Reserved. This site was designed by Pat Briggs, Roger Briggs and Doug Kidd.